With vast industrial experience, we are involved in offering a wide range of Coconut Juice. We have carved a niche amongst the most trusted names in this business, engaged in offering a comprehensive range of Coconut Water. We offer Packed Tender Coconut Water. Selected coconut from natural taste. It can preserve upto 6 months in ordinary temperature, also it can preserve 1 year in cold storage. 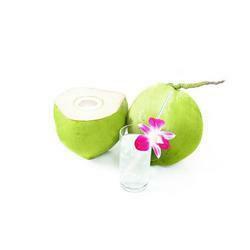 Coconut Drink is the clear liquid inside young green coconuts (fruits of the coconut palm). In early development, it serves as a suspension for the endosperm of the coconut during their nuclear phase of development. As growth continues, the endosperm mature into their cellular phase and deposit into the rind of the coconut meat. Coconut water is one tasty healthy drink. Coconut water is get from the fresh coconuts procured from Pollachi and Kerala at the time of breaking for copra making process.